Ground is located just off the Windermere Drive Roundabout - the entrance is located on the first turning on the left before Sainsbury's Supermarket. (Changing Rooms on Ground). Ground is located on the junction of Bilford Road and Droitwich Road, just prior to mini roundabout. Parking is on main Bilford Road (Changing Rooms on Ground). From Worcester - take the Main Road into Upton Snodsbury (A422 Stratford Road). Go past The Oak Public House and take the first turning on the left. The ground is located at the bottom of this Laneway. (Changing Rooms on Ground). Access to ground is via first left hand turning from New Road Roundabout - signposted Slingpool Walk. Ground is located at bottom of Slingpool Walk at back of Athletics Track. Car Parking available next to Athletics Track. (No Changing Rooms on Ground). From Worcester - pass through Colwall Stone and The Elms School until railway bridge - pitch is on the right immediately after bridge. (No Changing Rooms on Ground). Ground is located between Royal British Legion Club and Scout Headquarters halfway along Cornmeadow Lane. (Changing Rooms on Ground). Ground is located on corner of Claines Lane and Droitwich Road. Car Parking is available at bottom of ground next to Tennis Courts, Limited Parking is available at top of Access Road on Ground. (Changing Rooms on Ground). From Worcester City Centre/City Walls Road, turn left onto London Road and then right onto the A38 Commandery Road. Turn first right before The Albion Public House into Diglis Road. Follow the road around to the right, past the Anchor Pub, and the Diglis Recreation Fields will be found a short distance along on your right. (No Changing Rooms on Ground). 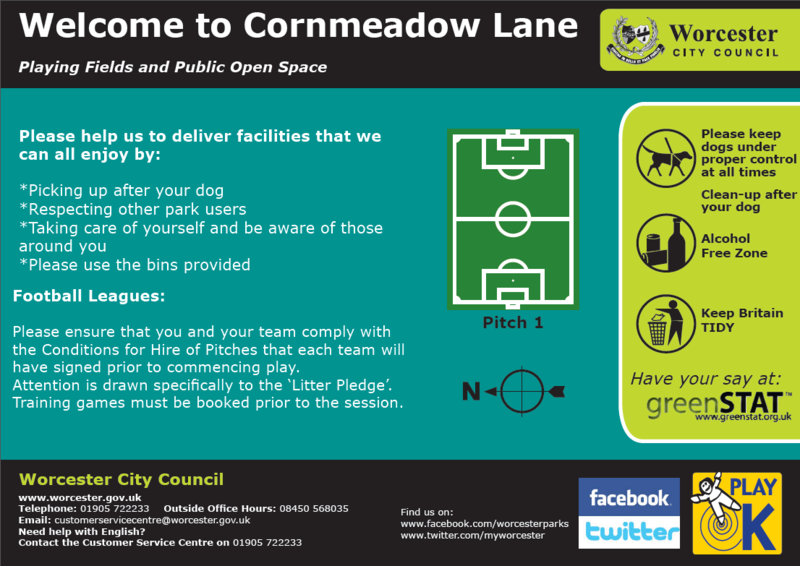 Ground is located on Access Road at back of Sherrards Green Road or via Lydes Road, behind Great Malvern Primary School. (Changing Rooms on Ground). 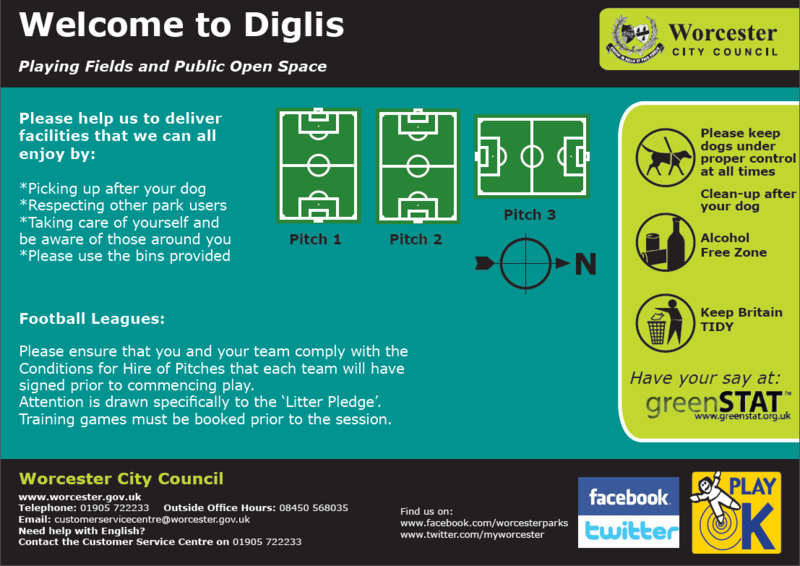 The Pitch is situated to the rear of Dyson Perrins CE High School, in Yates Hay Road, Malvern Link, across the road from the Ministry of Defence's former 'North Site'. Limited parking is available. (Changing Rooms on Ground). From Worcester, Ground is located down left-hand turning immediately before The Crown Inn. Ground is located next to Hallow Village Hall. (Changing Rooms on Ground). From Worcester, at the Powick traffic lights junction (just before the Crown Pub) turn left into Hospital Lane, taking the first left to the Playing Fields. Please note, limited parking is available. (Changing Rooms on Ground). From Worcester, travel via Lower Broadheath - enter Martley Village, past Sport Martley and Chantry High School. At T-Junction with Central Stores in front of you, turn left, follow this road for 0.2 miles and ground is located on your left. (Changing Rooms on Ground). 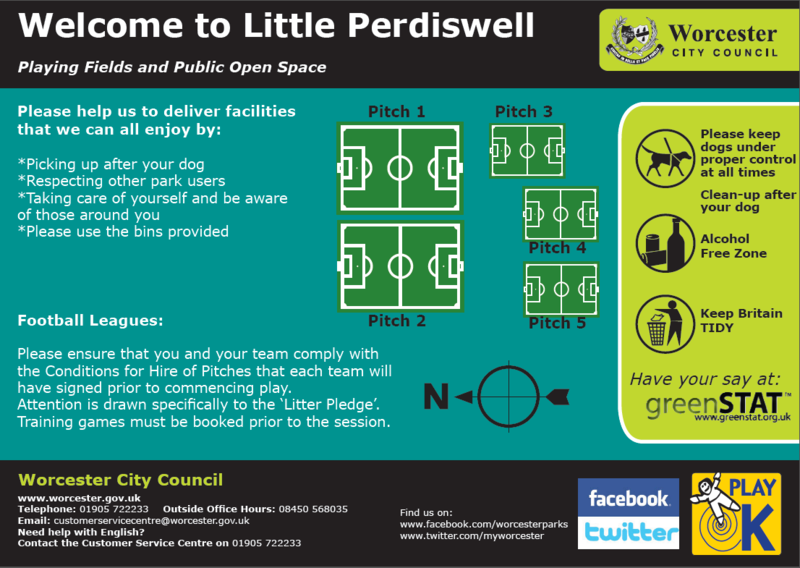 Ground is located in Ash Avenue, off Brickfields Road (Changing Rooms on site). From Worcester, take A38 towards Droitwich. Before entering Droitwich take 1st exit at first roundabout (signposted A38, Bromsgrove). At next roundabout take 3rd exit onto Ombersley Way (A4133), then take 3rd left (Briar Mill) signposted "Leisure Centre". 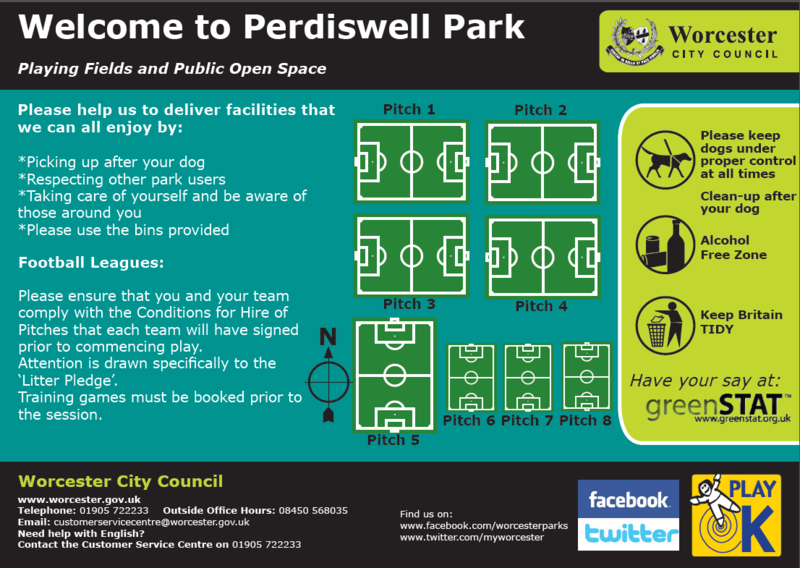 Grounds are located at back of Droitwich Sports Centre. (Changing Rooms on site). From Worcester on the A449 until the junction with the B4208 at Newlands (Townsend Way Roundabout). Follow the B4208, and enter Malvern link. Stay on the B4208 until you see a Cricket Ground on your right. Opposite the Cricket Ground is Orford Way. Turn left down Orford Way and then turn left into Langland Avenue. The ground is is infront of you on the left. Heading out of Worcester - the ground is located halfway along Droitwich Road, opposite Park & Ride Station - Car Parking is Available here. (Changing Rooms on Ground). From Worcester, take A449 Bromwich Road towards Malvern. After taking 2nd exit across large roundabout and just before entering Powick take left turning next to Red Lion Pub on staggered roundabout signposted B4424 (Upton Road). On entering Callow End turn left onto Lower Ferry Lane - ground is located half a mile along this road on your left. (Changing Rooms on Ground). From Worcester on A449, go straight over roundabout and continue over pelican crossing, until you reach 2nd set of lights, with Texaco Garage on your left. Take the next right into Lower Howsell Road. Continue past 5 left hand turns, and the ground will then be on your left. (Changing Rooms on Ground). Swinyard Road, WR14 1GU Malvern, Worcestershire (Changing Rooms on Ground). From Worcester City Centre take the Droitwich Road heading north. Turn right at set of lights just before the Perdiswell House Public House - and go between the stone pillars. Go past Nuffield Health Club (on left) and where road bends left, go straight ahead. Neel Park is on left with it's own car park. (Changing Rooms on Ground). From Worcester City Centre take A449 Ombersley Road (signposted Kidderminster). Take left turn at Texaco garage opposite Co-Operative Supermarket into Northwick Road. Ground is located half a mile along this road on the left. (No Changing Rooms on Ground). Ground is located at southern end of Littleworth Village on Wadborough Road. (Changing Rooms on Ground). From City Centre follow signs for M5 South and this will take you out of the City along the A44 London Road. At the top of London Road Hill turn left into Spetchley Road (at the odd shaped roundabout). Take the second turning on the left and follow this driveway around to the right with Nunnery Wood School on your left to arrive at Nunnery Wood Sport Centre car park. (Changing Rooms on Ground). Heading out of Worcester - the ground is located halfway along Droitwich Road on right, past the Park & Ride Station and just before Ravenmeadow Golf Club - opposite The Raven Public House - Car Parking is Available here. (Changing Rooms on Ground). From Worcester (A449), enter Ombersley Village. Travel through village until you reach the main roundabout near the church in Ombersley, take second exit towards the Kidderminster (A449). Then turn second left into Sandys Road after some tall trees and opposite the Bakery. The Ground is on the left. (Changing Rooms on Ground). Complex located on Bilford Road - turning opposite that of Worcester Recycling Centre. (Changing Rooms on site - Referees need to leave £10 deposit with Reception for key card to changing rooms). 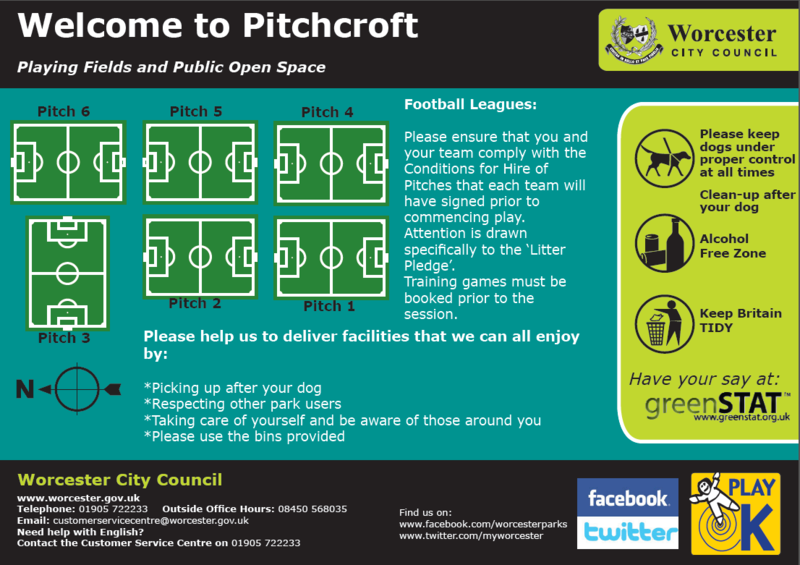 Pitches located at northern end of Racecourse - accessible via Pitchcroft Lane off Somers Road. (Changing Rooms on site). From Worcester, take A38 through Droitwich. At large roundabout at Berry Hill Industrial Estate, take the A442 towards Kidderminster. Pass through Hampton Lovett. You will then come to Cutnall Green. About halfway through the village, turn left opposite The Chequers Public House into School Road. Ground is located down this road on the left opposite the Cutnall Green First School. (Changing Rooms on Ground). 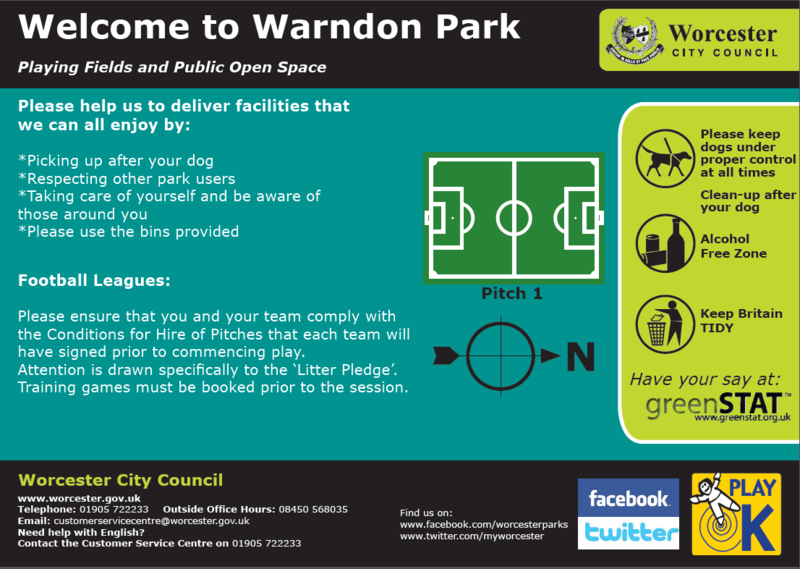 Pitch is next to Warndon Community Centre, located on turning off Shap Drive, just off Windemere Drive. (Changing Rooms on Ground). From Worcester head towards Malvern on the A449. Take 1st exit at Countrywide roundabout B4208. Continue on B4208 and proceed over the next 3 roundabouts. Turn left at traffic lights into Pickersleigh Road. At the roundabout take 3rd exit on Madresfield Road (You should be travelling uphill). Take the 3rd right onto Greenhill Drive and continue to the Pitch at the end of the road. 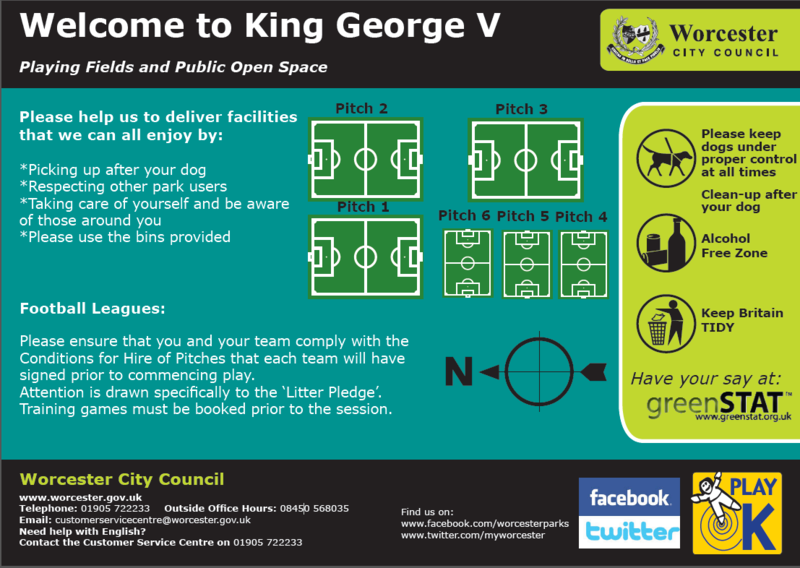 (Parking and Changing Rooms on Ground). Ground is located next to Suckley School. (Changing Rooms on Ground). From Worcester - follow the road through Kempsey, go past The Crown on the left, The Talbot on the right, Walter de Cantalupe on the left and the Anchor Inn on the right. On the large grassed area for the Lawns Rest Home on your right you will see a sign pointing left saying 'Playing Fields'. Turn left into Plovers Rise, follow the road up the hill past the houses. The Playing Fields are directly ahead between the houses. (Changing Rooms on Ground). The Farm entrance is off the A443 Worcester to Tenbury Road, just after Hallow if travelling from Worcester. It is clearly sign posted. Once you go through the Farm entrance keep to the left and head towards the Activity Centre and Cafe. You will see a lake on your left. The football pitch is nearby. (Changing Rooms on Ground). From Worcester City Centre - take A44 New Road towards St. Johns. Cross roundabout just after County Cricket Ground, taking 2nd exit, into St Johns. Turn right onto Henwick Road (at junction with Bush Inn and Co-Operative Supermarket). The Entrance to the University is 0.7 miles on the left of Henwick Road at junction with Hylton Road. University Pitch is located just inside Main Gates just off Henwick Road. Changing Rooms are located in the University Sports Centre next to the pitch. Please note that this is a 3G Pitch - appropriate footwear is needed. From Worcester on A449, go straight over roundabout and continue over pelican crossing, until you reach 2nd set of lights, with Texaco Garage on your left - continue straight on. At next set of lights at crossroads, turn left into Pickersleigh Avenue. Turn next left into Victoria Park Road where car park for ground is located. (Changing Rooms on Ground). From Worcester & Droitwich head towards Bromsgrove on A38. Enter Wychbold (just after M5 Junction 5) and halfway through the village turn right at The Crown Public House into Chequers Lane, then a right into De Wyche Road. Follow the road round, onto School Road, go past theWychbold Royal British Legion to the end of the road where you will come to a dead end. 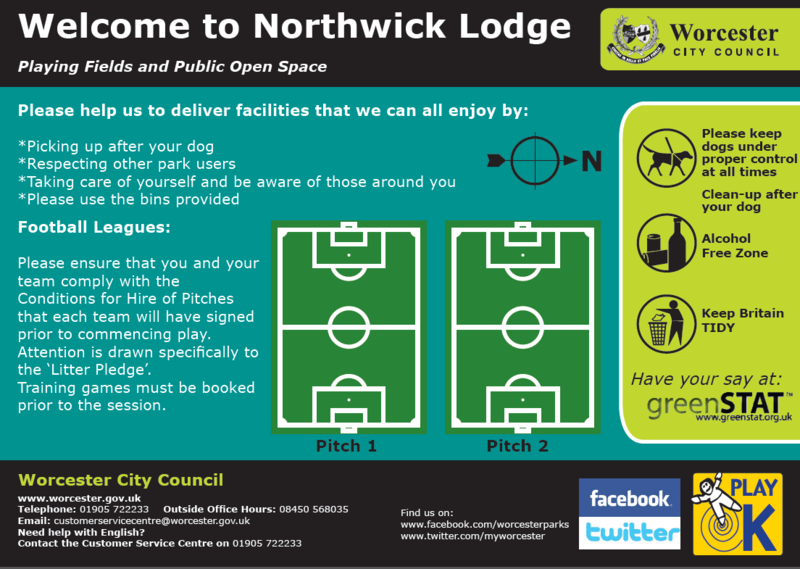 Wychbold Village Hall and Playing Fields are situated there. (Changing Rooms on Ground). From Worcester City Centre - take A44 New Road towards St. Johns. Cross roundabout just after County Cricket Ground, taking 2nd exit, into St Johns. Turn right onto Henwick Road (at junction with Bush Inn and Co-Operative Supermarket). Ground is located a third of a mile on the left of this road at rear of YMCA - just after Railway Level Crossing. (Changing Rooms on Ground).